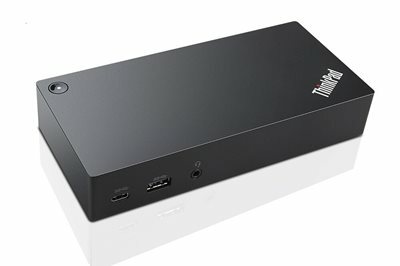 The ThinkPad USB-C Dock works with ThinkPad and Lenovo laptops, and utilizes the same USB-C standard technology found on a wide range of popular laptops and devices. Experience all your productivity needs including video, data, and wired Ethernet all while delivering continuous power to your laptop via a robust USB Type-C port. A single UHD display 30Hz or dual FHD displays allows you to enjoy a vivid video displays for more detailed worked. And It's tailor-made for large enterprise withe convenient manageability features like PXE boot, Wake-On LAN and MAC address pass-through. Simply connect your laptop or tablet with the dock and boost your productivity in no time.